From his native Monroe, Louisiana, to his current residence of Dallas, Texas, Bradie Gene James has always been a leader, unafraid to tackle any challenge or obstacle whether on the football field — or the boardroom. James’ journey to stardom began back in West Monroe where he was an All-State linebacker for the West Monroe Rebels, leading them to the 1999 Class 5A state championship. After graduating, James headed a few miles south to Baton Rouge to the picturesque campus of Louisiana State University. He quickly made his mark there as a member of the football team and as a high-achieving student. While playing for the Tigers, James was a two-time All-SEC selection and left LSU as the school’s second-leading tackler. He was also named an All-American his senior season, after making the switch from weakside lineback to middle linebacker. But James, as he is to this day, wasn’t just satisfied to be a hard-charging jock. He excelled in the classroom as well. He was chosen as a National Scholar Athlete by the National Football Foundation and was on the All-SEC Academic Honor roll. 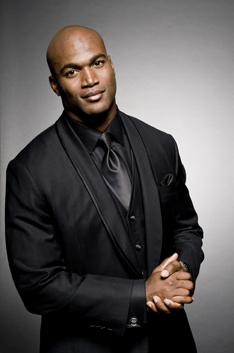 He graduated from LSU in 2003 with a degree in criminology. In 2003, the Dallas Cowboys made James their 4th pick of the draft. He came to Dallas as a backup linebacker, but excelled on special teams where he finished his rookie season fourth in special teams tackles with 16. 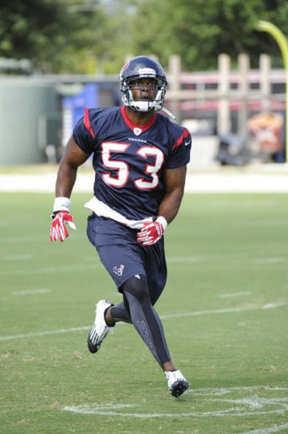 After becoming a free agent in 2012, James signed with the Houston Texans. 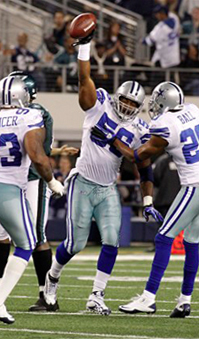 He retired from the NFL as a Dallas Cowboy on May 6, 2014. By 2005, he was the team’s starting middle linebacker and in 2007, he was named defensive captain. He has continued to shine and has quickly become one of the Cowboys undisputed team leaders. Much of that leadership is because the eloquent James is as active off the field as he is on it. Always the humanitarian, he has actively participates in charity events and is always ready to offer his assistance — and his informed opinion — in a variety of areas. But as much as James has accomplished, he hasn’t forgotten his humble roots. He has personally invested an endless amount of effort educating others about the importance of effectively utilizing services and resources to maintain a quality life. James has taken some hits in life on and off the field. The death of both of his parents, three months apart was one of the hardest hits he’s taken in his life. After voluntarily maintaining his silence about losing both of his parents the first four years of his professional career in the NFL; he finally decided to start sharing his story with the public. The death of his mother influenced James’ decision to establish Foundation 56, to help stamp out breast cancer. Established in 2007, James uses the foundation to help raise money in the fight against the often fatal disease. Named after his Dallas Cowboys jersey number, Foundation 56, a faith-based organization is dedicated to expanding and enhancing the quality of life of women, men and their families who have been directly and indirectly impacted by breast cancer. Foundation 56 provides access to breast cancer services and resources throughout the country. To date, Foundation 56 has donated more than half a million dollars. Foundation 56 has contributed to funding mobile mammogram units to serve communities in South Louisiana and North Texas. 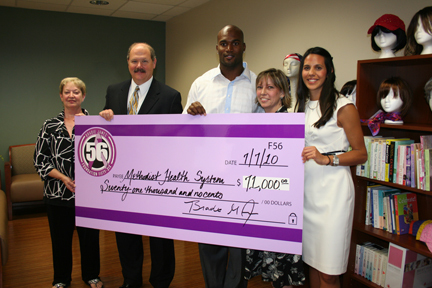 In October 2011, the foundation unveiled the Bradie James’ Resource Center inside of the Women’s Imaging Center inside of Methodist Dallas Medical Center. The resource center offers everything from fitted wigs, prosthesis, social therapy programs, support groups, and more. The foundation has been able to serve more than 25,000 people through partnerships made possible by American Cancer Society, Susan G. Komen for the Cure, Methodist Health Systems, and a host of other partners. Foundation 56 also provides transportation services for women in need to get to physical therapy, chemotherapy, and radiation treatment (approx. 20 appointments each week). James has been the primary donor to the foundation for more than 4 years of the Foundation’s existence. James and recipients of Foundation 56 help have been able to share their stories on CBS Evening News with Katie Couric, Reader’s Digest, AARP and the NFL Network. In addition to working with his own foundation, James also serves as a health ambassador with GlaxoSmithKline. In 2012, he was honored to be selected as the LSU Young Alumnus of the Year. He is a partner at Premier Electronics and owner of several Mooyah Burgers Fries and Shakes locations in North Texas. Currently James is a Captain with The Trust (powered by the NFL Players Association) where he works with former NFL players, helping them make a successful transition out of professional football. He resides in Texas with his wife, Star, and their children, Ace and Aston. Plan Now to Donate on North Texas Giving Day!